A company called Winning Moves contacted us earlier in the year asking if they could use some of our images on the new Highlands and Islands Monopoly game that was to be launched late 2010. Searching for material they found my website and loved the photographs. 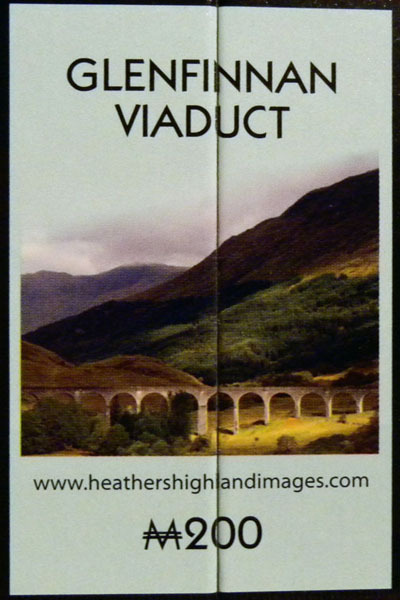 They particularly liked the photograph of Glenfinnan Viaduct which they used as one of the utility squares on the board itself and underneath my website is printed !! Several of my other images are used on the box lid and the centre of the board. They also loved my husbands images and used several of his wildlife shots on the box lid and the centre of the board also. We are both delighted to have our work on the Monopoly board, the game has a long history and it's nice to be a part of that.